The Brimblebanks Brothers are back with our second Electronic Storytime for your aural enjoyment. 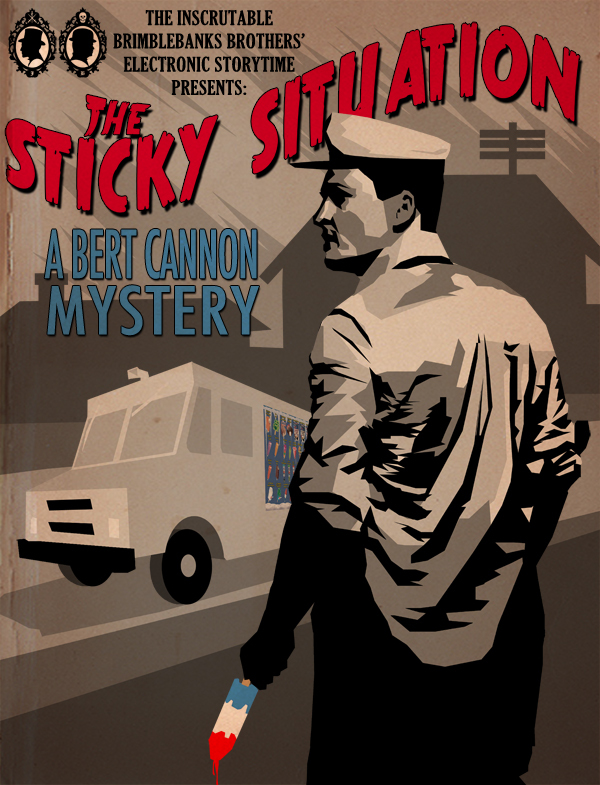 This month we present: “The Sticky Situation: A Bert Cannon Mystery.” It’s a story about sweet treats and bitter pills as an unlikely hero goes looking for a missing mutt. Sometimes the truth is like an ice cream treat – if you don’t keep after it, things can get messy quick. This episode was written by Brodie H. Brockie and stars Brockie as Bentley Brimblebanks and Justin Vidovic as Jameson Brimblebanks. The story’s voice cast includes Patrick Johnson as Bert Cannon; Jennifer Burks as Genevieve Turtletaub, Jenny Valentine, and Tubby Malone; Amanda Burch as Muffy Turtletaub and the Nerdy Kid; Krinn Hess as Sally Smedley and the Toffee Bar Crunch Kid, Justin Vidovic as Officer O’Mally and the Dog Pound Guy; and Brodie H. Brockie as Buddy and Bert’s Boss. The Voxbot 5,000 appears as herself. This episode’s Commercial was written by Brodie H. Brockie and stars David Melcher, Amanda Burch, Patrick Johnson, Justin Vidovic, and Brodie H. Brockie. Our musical guest for this episode is Marie Fleur performing “Shine On, Shine On” written by Marie Fleur and Danny B. Harvey. Put on a fedora and head on over to mariefleur.com to hear more of her modern spin on old-fashioned swing. This entry was posted in podcasts and tagged Bert Cannon, Brimblebanks Brothers, Brodie H. Brockie, comedy, detective, dogs, ice cream, Justin Vidovic, Marie Fleur, mystery, noir, parody, podcast, story. Bookmark the permalink.